BRIDGEWATER, Mass. - Those who predicted the Rockland boys hockey team would make the tournament this year were proven right Wednesday. 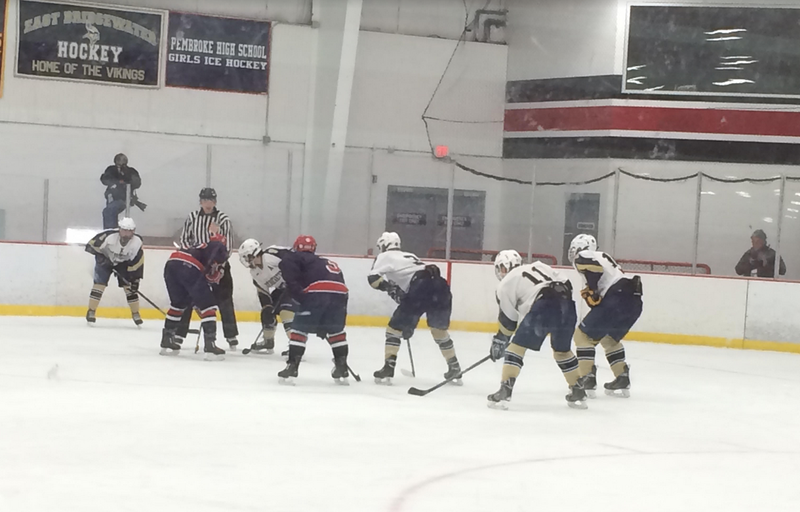 Though they are barely past the midway point of their season, the Bulldogs (11-0-1) clinched a spot in the MIAA Division 3 South playoff bracket with a 5-0 win over the East Bridgewater Vikings (3-7-3) at Bridgewater Ice Arena. The win gave the Bulldogs two points in the standings, which brings them to 23 on the year. Playing a 22-game schedule, they needed 22 points for a playoff spot, which they no long have to worry about. It is the ninth straight year the Bulldogs have made the playoffs. "Nobody in that room has never not made the tournament," Bulldogs head coach Mike Flaherty said of his team. "That feels pretty good. To clinch this early in the year too is pretty amazing." The Bulldogs bout against the Vikings was like many of their regular season games thus far. The Bulldogs used their speed and skill to dominate puck control. In turn, they created a plethora of scoring opportunities for themselves and severely limited what their opponent could do in their few chances. "We're a pretty fast team," Flaherty said. "It's hard for teams to adjust to us. If we control the puck and play fast, it's a real good recipe for success." Early in the game, the Bulldogs established themselves as the alpha, attacking the Vikings net with the puck. About seven minutes into the first period, their aggressive strategy proved to be the right one, as they intercepted a Vikings pass which led to their first goal of the game. When the puck got to junior forward Mike Flaherty, he blazed past a pair of Vikings defenders in East Bridgewater territory, creating a mini-breakaway. Close to the net, Flaherty putted in the Bulldogs first goal from the left side. Freshman forward Zach Callahan shined, scoring two goals for the Bulldogs. Sophomore forward Brian Goode and junior forward Joe Yeadon each added goals. It was Goode's first goal of the season. Normally the backup, sophomore Jake Johnson got the start in net for the Bulldogs and recorded his first career shutout. The Bulldogs offense has been strong this season. In seven of their 12 games, they have scored five goals or better.